I’m beginning to realize one doesn’t need hundred different measurements, proportions, and ingredients for some recipes – getting a basic recipe right then working around it creates a new dish. Or a new cookie. 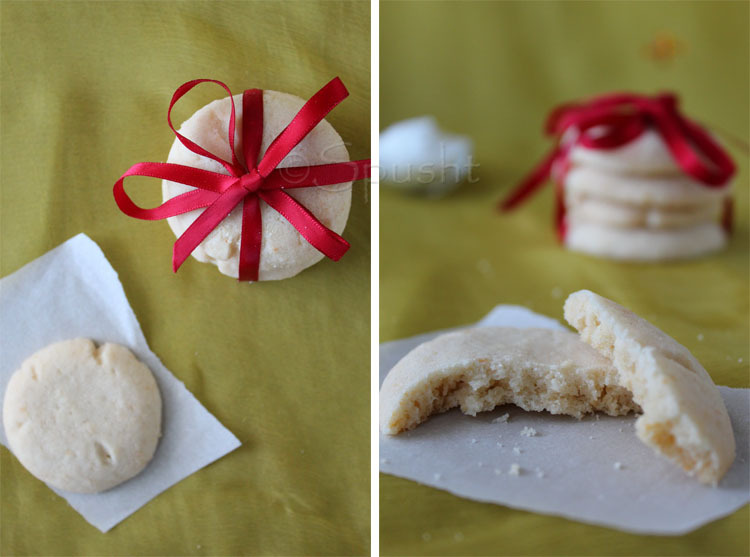 Like these coconut cookies. Ever since I tried the Chocolate-Coconut Muffins and fell in love with the fragrance of toasted coconut, I've been waiting to try more recipes with coconut. Get ready to be transported to an imaginary beach because that’s where the aroma and flavor of these simple melt-in-your mouth Eggless Coconut Cookies will take you to. 1. Prep : preheat oven to 140oC [~ 275oF] + grease/line baking sheet. 2. Sieve : flour + baking powder + salt; no lumps. 3. Whip : butter + sugar + vanilla; till light & fluffy. 4. Mix : flour mixture + butter mixture + coconut; make soft dough. 5. 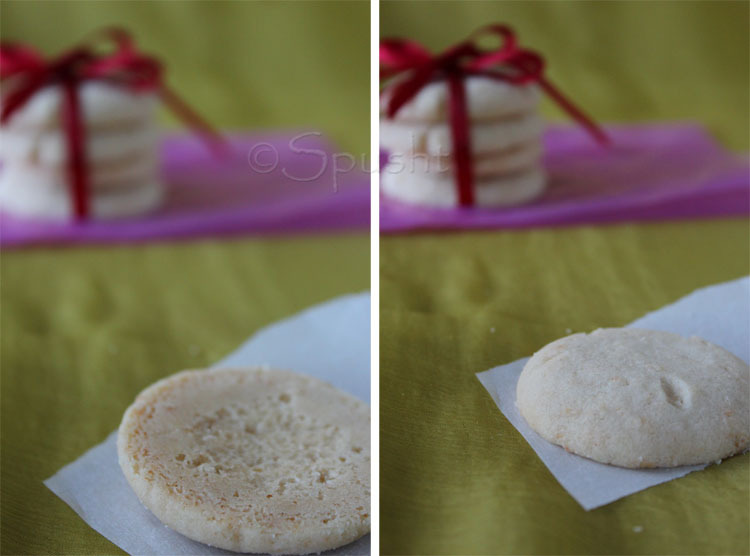 Shape : roll out ¼ inch thick using some dry flour, cut using cookie cutter or just roll balls & flatten. 6. Bake : 140oC [~ 275oF] for 15-20 minutes till light brown, keep an eye, remove when edges/bottom turns light golden-brownish. 7. Done : let cool down on rack, store in air-tight container. 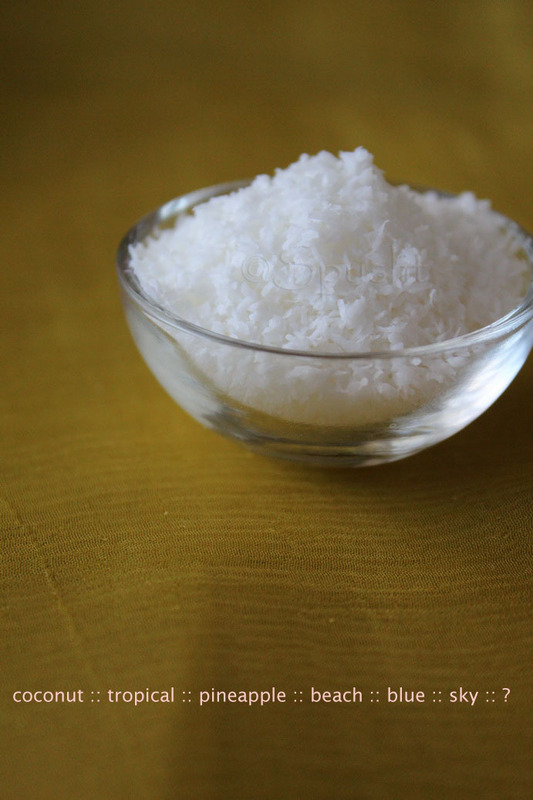 Note: You may roll them in some desiccated or dry shredded coconut too before putting to bake. You'll get a toasted coconut taste on the outside. So you see what I was talking about a basic recipe - subtracting chocolate from the simple Chocolate Cookies could turn them into Vanilla Cookies. 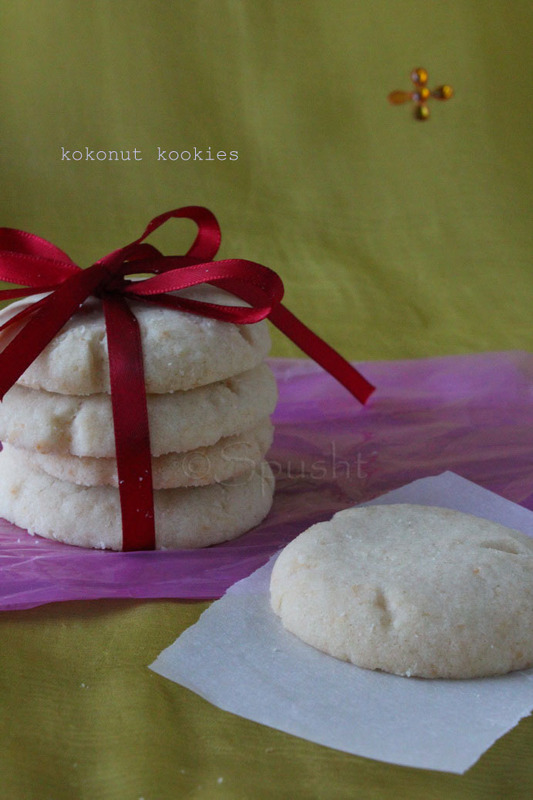 And adding desiccated coconut to the vanilla cookies could turn them into Coconut Cookies. My math classes are finally proving to be useful. beautiful cookies. love coconut flavour and gonna try this recipe very soon. Thanks Sayantani, tell me how it turns out. So pretty...these look fantastic. And the red ribbon? Such a great touch. Thanks Ameena! Hope yours was great in NY! Perfectly baked cookies, asusual nice clicks. Excellent and elegant cookies,feel like munching ssome.. I love any thing with coconut !! These cookies tempts me a lot !! Rightly baked and yummy !! Very cute and pretty cookies..
i am a coconut.. have added dessicated cocnut to my shopping list... ooohhh .. love your clicks.. bookmarking this..!!! Let the Q and A begin! Pattagobi ki Sabzi; Cabbage Vegetable?! What do you give / take / like from USA?